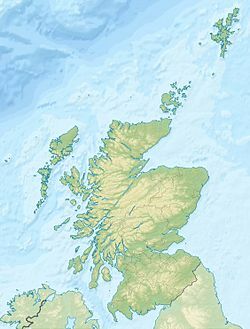 The Moray Firth (/ˈmʌrifɜːrθ/; Scottish Gaelic: An Cuan Moireach, Linne Mhoireibh or Caolas Mhoireibh) is a roughly triangular inlet (or firth) of the North Sea, north and east of Inverness, which is in the Highland council area of north of Scotland. It is the largest firth in Scotland, stretching from Duncansby Head (near John o' Groats) in the north, in the Highland council area, and Fraserburgh in the east, in the Aberdeenshire council area, to Inverness and the Beauly Firth in the west. Therefore, three council areas have Moray Firth coastline: Highland to the west and north of the Moray Firth and Highland, Moray and Aberdeenshire to the south. The firth has more than 800 kilometres (about 500 miles) of coastline, much of which is cliff. View from Findhorn: The hills across inner Moray Firth end in Tarbat Ness. The mountains in the background rise behind Dornoch Firth. A number of rivers flow into the Moray Firth, including the River Ness, the River Findhorn and the River Spey. Various smaller firths and bays are inlets of the firth, including the Cromarty Firth and the Dornoch Firth. The Pentland Firth has its eastern mouth at the Moray Firth's northern boundary. The Moray Firth is effectively two firths, the Inner Moray Firth 57°33′N 04°09′W﻿ / ﻿57.550°N 4.150°W﻿ / 57.550; -4.150, which was traditionally known as the Firth of Inverness, and the Outer Moray Firth which is more open North Sea water. The name "Firth of Inverness" is rarely found on modern maps, but extended from the Beauly Firth in the west, to Chanonry Point in the east. The Moray Firth is visible for considerable distances, including a long range view from as far to the east as Longman Hill. From Buckie, on a clear day it is possible to see Wick in the far north of Scotland more than 80 km (50 mi) away. From Lossiemouth it is possible to see the hills of Caithness and the hills are easily identified, one being Morven and the other being Scaraben. From Burghead, the white mass of Dunrobin Castle can just be made out in the distance on a very clear day; from Nairn, the two red bands on the Tarbat Ness Lighthouse around 30 km (20 mi) away, can be seen with binoculars. The Great Channel in the Inner Moray Firth, was dredged by engineers in 1917 for the safe passage of ships that wanted to avoid the long and dangerous passage around the north of Scotland, by transiting the Caledonian Canal. The Channel went from the entrance of Munlochy Bay to the Meikle Mee Starboard Hand Mark, but was not maintained and filled in very quickly. Basically, the Moray Firth is of tectonic origin, related to the Great Glen Fault. For some time during the glaciation, the whole of nowaday's Moray firth was a huge glacier. Nevertheless, the inner Part and its side-inlets, Cromarty Firth and Dornoch Firth, are true fjords themselves. Though there is a reasonable tide with mean tide ranges of about three metres (ten feet), only part of the rivers draining into the bay have estuaries. Masses of sediment from the adjacent mountains have formed spits around several mouths. Those of River Ness and River Carron have significantly narrowed the fjords they enter. The Moray Firth is one of the most important places on the British coast for observing dolphins and whales. The most common species are the bottlenose dolphin and the harbour porpoise. With occasional sightings of Common dolphin and Minke Whale. The popular wildlife viewing area located at Chanonry Point host some spectacular displays of dolphins within the inner Moray Firth. There are also visitor centres at Spey Bay and North Kessock run by the Whale and Dolphin Conservation Society where dolphins and other wildlife can often be seen. The old jetty at the Fort George Point is the location of the Dolphin Research Centre, with leading marine biologist Prof. Greame Taylor working part-time studying hunting and breeding habits and part-time working with the Community Council giving tours and teaching the ways of the dolphin. It is also an important oil field and fishing grounds. The Beatrice oil field in the Outer Moray Firth is the closest of the North Sea oil fields; it is also the site of the Beatrice Wind Farm. Much of the fishing industry focuses on scallops and Norway lobsters. The Inner Moray Firth is designated as a Special Protection Area for wildlife conservation purposes. The Moray Firth contains a Special Area of Conservation (SAC) designated under the EU Habitats Directive, which is one of the largest Marine Protection Areas in Europe. The SAC protects the inner waters of the Moray Firth, from a line between Lossiemouth (on the south coast) and Helmsdale (on the north coast) westwards. ^ "Inner Moray Firth". Ramsar Sites Information Service. Retrieved 25 April 2018. ^ "Scottish Natural Heritage No 50 (1996): The Dornoch, Cromarty and Beauly/Inverness Firths" (PDF). Archived from the original (PDF) on 2 May 2014. Retrieved 2 May 2014. ^ "Scottish Natural Heritage No 51 (1996): Estuaries of the Outer Moray Firth" (PDF). Archived from the original (PDF) on 2 May 2014. Retrieved 2 May 2014.